The format is still fairly new and not yet widely supported, so I'll give a quick example of how it's used. This is text that will appear over the video at during the in/out points. You can use HTML within WebVTT, pretty cool. The next thing to do is to let your HTML video know about the WebVTT file. That's done using the track element. That's all there is to it. If we played the fictional video above we would see the two captions appear at the times provided in captions.vtt. For a more in-depth look at the track element I suggest Getting Started With the Track Element on HTML5 Rocks. That's where I first learned about all this goodness. WebVTT is very specific about the time format for cues. Cue times must be represented exactly as shown in captions.vtt. It's easy to type out the times in that way, but how do you find precise times using HTML video? HTML video controls display the time of the video, but only down to the second. And not in the format needed for WebVTT. This is why I wrote Cuemarker. Cuemarker provides a keyboard shortcutâ€“the period keyâ€“for setting in/out points and outputting the cue time in the required format. Cuemarker also provides shortcuts to interact with HTML video. You can play/pause using the space bar and seek forward/backward using the right/left arrow keys. Those controls allow you to arrive at more precise moments in video than you can using the default video scrubber provided by the browser. I'll go back to the HTML in the previous example, but I'm going to remove the track element. For marking cue times you only need an HTML video. That's a bare-bones example and may be all that you'll need. The cue times will be output using console.log. Here's another example using both the available options. In that example, the seek interval is less precise than the default and the cue times will be injected into the page as li elements that are children of the ul with an id of "cuetimes". Cuemarker doesn't try to get cute by attempting to transfer cue times to a WebVTT file. All it's interested in doing is outputting the in/out times. 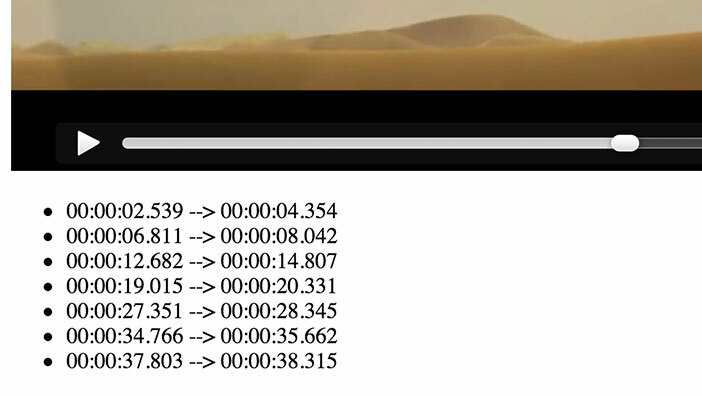 Once you've marked in/out times you can copy them over to your WebVTT files. That's how I've been using it and it's working really well for me. A working demo of the latter example is located here. Yep, that's what I got for now. Again, the track element and WebVTT are not yet widely supported. As of this writing only the latest Chrome and Opera are cool enough to do so. The Web moves fast though and I know it won't be long before Firefox and Safari follow suit. Limited support for the underlying technology means that this is a tool you may not need today, but you might tomorrow. Fork it!